Please note: This is a momma of a canning post. If you're new to this, you may begin to feel overwhelmed. Resist! I'm offering you my experience in a way that (hopefully) is easy to understand, that will cover any questions you may have and that will give you the best chance of success. This is how *I* can. Others may have slightly different methods. This is what works well for us. Before you know it, you will be doing these steps in your sleep...but it's safer to be awake. I've shown you what 5 items you need to begin canning. Now, I'm going to explain how you get ready to can. 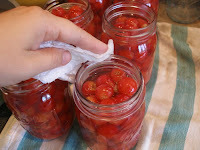 These steps can be taken before you even begin to make what you will fill your jars with (if the process takes little time) OR can be done during, like in the case of tomato sauce where you will have some free time while the sauce cooks down (a perfect time to do canning prep). A word about using a large pot instead of a canner: It is fine to do!! I often use a large pot if I have a small batch of something to can (4 or 5 jars). Just make sure that the pot is deep enough to have the water come up to the shoulders of the jars and that you can place the lid on your pot with the jars inside. It will need to be deeper for quart jars than pint jars. I place an old dish towel in the bottom of my large pot for the jars to sit on. This adds some cushion so the jars won't rattle too much against the bottom of the pot. Substitute "large pot" in your mind for any time I say "canner" throughout this post. 1) Ready your jars. It's important for your jars to be clean and sterile when you fill them. It is also important that they are hot if you are going to be adding hot liquid or sauce to them. You have two choices here. Some people run their already washed jars through their dishwasher by themselves (so no food residue from other dishes will get on/in them). The heat from the dishwasher sterilizes them and if left inside after the cycle, they will remain hot. I sterilize my jars in my canner. I add water to my canner along with however many jars I think I may need and bring the water to a boil with the jars inside. The jars do not need to be covered with water. The steam helps sanitize them and the water will make them hot. This is safe because the jars are coming to a boil along with the water (so to speak) instead of being cold when placed in the boiling water. 2) Ready you lids. Jar lids need to soak in very hot water, so the seal will soften and mold better to the rim of the jar when you're ready to lid your jars. Again, you have a couple choices. You can do what I do which is to put your lids in your canner with your jars and boiling water. If you throw them in there loose, you'll have to fish them out individually with your jar lifter which is a pain. I use a clothes pin to clip four or five lids together and drop them in. 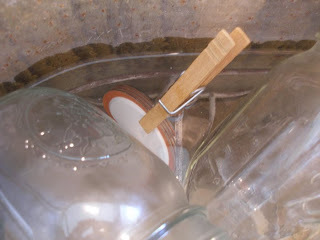 A clothes pin is easier to fish out with the jar lifter and I can use several clothespins if I have lots of lids to ready. 3) Prepare your "canning zone". I place an old dish towel on the counter right beside my stove. It keeps wet jars from sliding and keeps hot water from running off the counter and onto my flip flop clad bare feet. This is where you will set your hot jars when you are ready to fill them, where you will fill your jars and top them with lids and rings. It will also be where you will place the hot, wet jars once they come out of the canner to cool and seal. 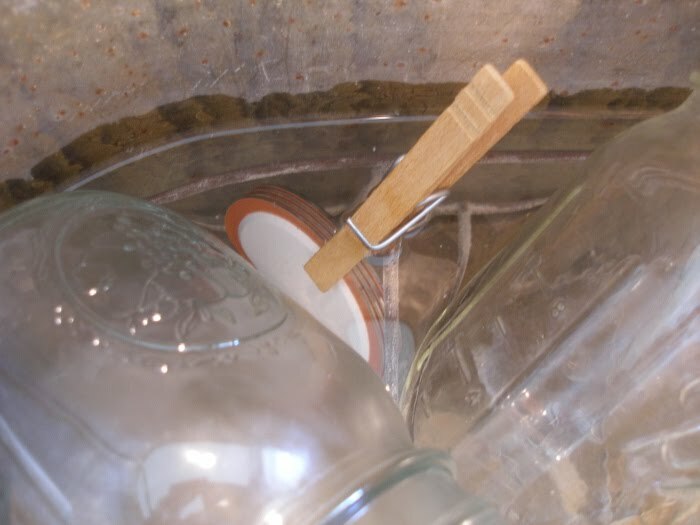 Lay nearby your jar lifter, your jar funnel, a couple paper towels, and nice glass of ice water for yourself. You have to stay hydrated, right? 1) When your filling is ready, set your hot jars on the towel in your canning zone (sorry, I know that sounds corny) using your jar lifter, making sure you've poured out any water. 2) Fill the jars using your jar funnel if needed. Make sure to leave one inch of headspace (empty space at the top of each jar). Gently tapping the jars or wiggling them helps settle the filling and releases any air bubbles. 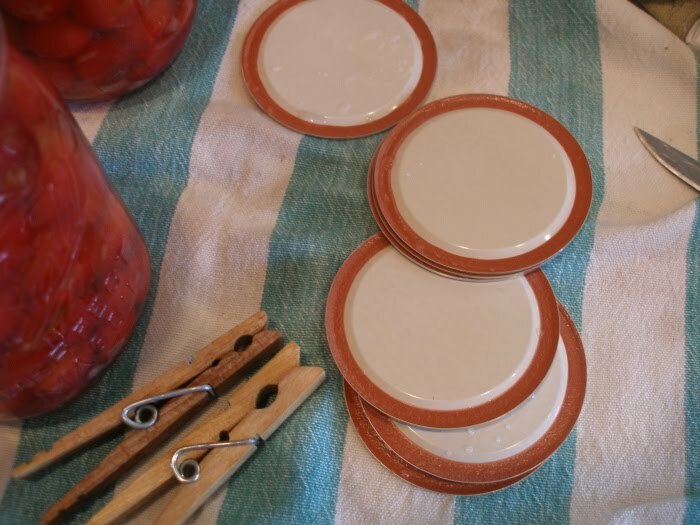 3) Wipe the rims of the jars with a clean, damp paper towel to remove any food residue. This will ensure a nice, tight seal. 4) Remove your hot lids from the water carefully! They will be very hot. 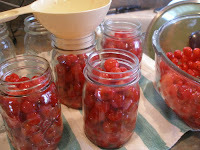 Let them cool just a tad until you can handle them and set one lid on each jar opening, centering it. 5) Place a jar ring on each jar "finger tip tight". What does this mean? This means that you will use only your fingers (not your whole hand) to tighten the ring, stopping when you meet resistance. Mini science lesson: Heat allows the gases and food to expand- causing a build up of pressure inside your jar. The pressure escapes from under the lid (if the ring isn't on too tight!). As the jar starts cooling, the pressure outside the jar is greater than inside and this presses down on the lid, allowing it to seal against the rim and the pressure actually presses the center of the lid down, often making that popping noise we all love to here. This seal is called a hermetic seal which means "completely airtight" so nothing can get in and contaminate the food. 6) Using your jar lifter, place the jars into your canner of boiling water, making sure that the water reaches the jars' shoulders. Process (or, let sit in the boiling water) per instructions for whatever it is you're canning with the canner lid on. 7) When the timer goes off, turn off the heat and let the jars sit in the canner for 5 minutes. 8) Remove the jars with the jar lifter, keeping them level, and set them where they will be undisturbed for several hours. If there is some water on top of the lids, that is okay. It will evaporate. 9) Always check for a seal. You may hear a "pop" when your jars seal, but it doesn't always happen and that's okay. Your jars can seal as you're lifting them out of the canner, or they can wait until several hours later. A jar, sitting on a counter surrounded by many other hot jars, is going to take longer to cool down and seal than the others. To check for a seal, run your finger GENTLY across the top of the lid. If you can feel (you can often see as well) that the center of the lid is presssed down, it has sealed. If it's still up (and feels like a bump), DON'T PRESS IT DOWN. That will create a false seal and could cause food spoilage. Any jars that don't seal after coming to room temperature should be refrigerated and eaten within a couple days. 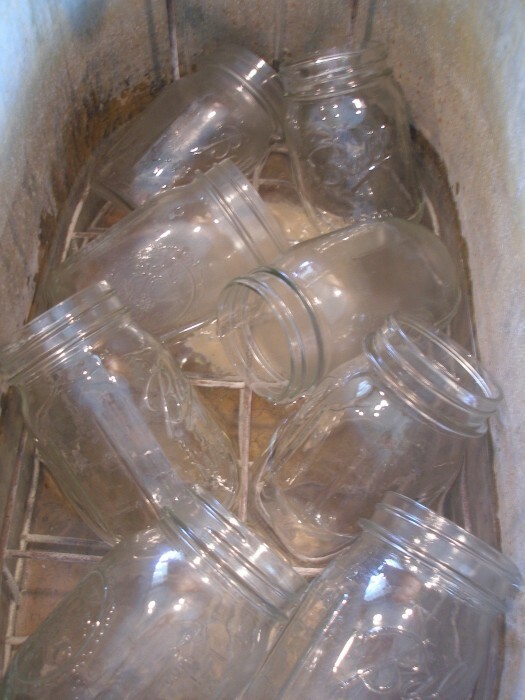 10) Once your jars have sealed, let them come to room temperature before removing the rings. Being very gentle and using a damp, clean rag, wipe around the threads where the rings were in case any filling seeped out. This will deter ants and fruit flies in your pantry. 11) Store your jars in a dark place that will not freeze or become very hot after you've labeld them with the contents and the date. Personally, I don't like to use sticker labels on my jars because they can be a pain to wash off. Instead, I just use a permanent marker and gently write on the lids, which will get thrown away one day anyway. 12) Please be careful! You will be working around boiling water, steam and hot jars- all which can burn. Use oven mits, take your time, and keep little ones from standing between you and your counter so you won't drip hot water on them. 13) Lastly, make sure to stand back and admire your beautiful jars and all your hard work when you're done. I've always wondered why this is called canning when you use jars to store the food and not cans. And my world was just turned upside down when you told us to remove the rings to clean the threads and....you didn't tell us to put the rings back on. Gasp! Where is the order in this world? Thanks so much for the tip about keeping the lids together with a clothespin. I'll give it a try next week when I'm canning. Kelley, If you need to keep those rings on, you go ahead and keep them on. The only time I leave them on or put one back on after canning is if I'm going to give it as a gift or travel with some jars (it does happen around here). I do this just in case it would get bumped hard enough to pop the lid off- I wouldn't want stuff going everywhere. Those that sit on the shelf are just fine without them:-). What a wonderful post! I have been longing to can.....been told i can't on a glass top stove but looks like this would work? What do you say? Still reading, still not freaked out, still ready to do this! Thank you for all these posts! I started reading your blog after your interview with Sarah at Clover lane and you have encouraged me to get more out of our garden. So far I have canned(1st time ever!) 15 jars of freezer strawberry jam and frozen four batches of green beans, with more to pick and freeze! I even talked my husband into expanding our garden and we may add a few more chickens to our "flock". SO thanks again for all your wonderful posts! Do you ever prep the foods in a crock pot? Like tomato sauce or the like? 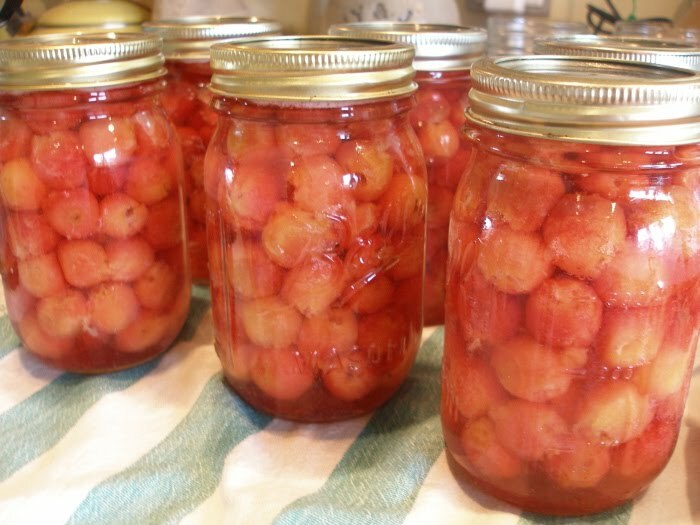 Great post and I look forward to trying canning for the first time this year! Very excited - and hoping my garden produces enough. Carissa, I have never tried it. I'm usually doing large batches (that wouldn't fit in my crock pot). I have heard of folks cooking down apple sauce to make apple butter in their crock pot and then canning it, but I haven't heard of many other uses for it. Good for you- trying canning this year. You can do it! Does anyone else out there use their crock pot for canning?? Thank you for the article about glass top stoves. I am so excited I went and bought the supplies........found a huge "canner" complete with rack for $18.00!!! YES! Now all i need is food...which in our state is not going to be around for another few months....HOT. TOO HOT! Thank you so much! If you ever ant any tips on solar cooking let me know!!!! I don't use my crockpot for canning, but it is verrrrry handy for making stock: put in a carcass from a roasted bird, water to cover, veg/aromatics, and turn on low for at least 12 hours. Ok, that clothespin tip is awesome! I always burn my fingers because I can't make my tongs get them fast enough! But ready for a mind-blowing fact: you CAN put your lids in the microwave!!! I cannot explain it, but my friend told me it's possible and that's how I canned all last summer. It's wild. You put them in a bowl with some water and pop them in the microwave. No sparks, no zaps, just hot lids. I've never tried to put the rings in the microwave, but I don't usually worry about them being hot. Thank you for this! I am teaching myself to cook and canning is on my list! I appreciate you taking the time to spell this out for people like me. I look forward to reading your other posts! 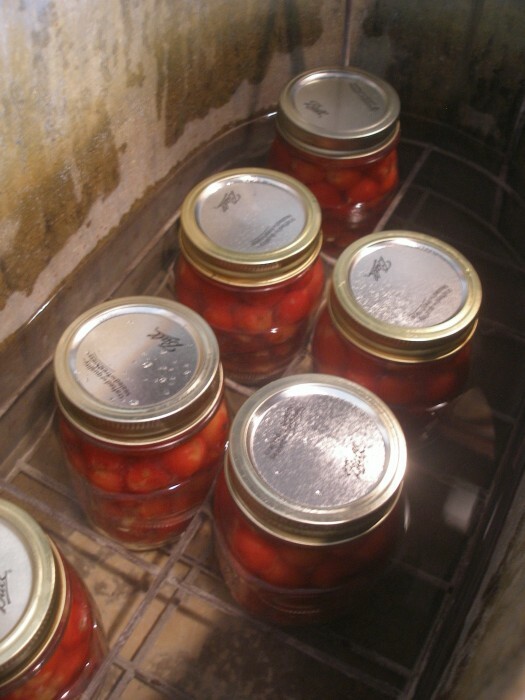 The first picture of tomatoes in a jar looks like unskined grape tomatoes - do you process them like this? Yes, makes more sense - but I was much more excited about the tomatoes!! Thanks for responding so quickly. Love your site! 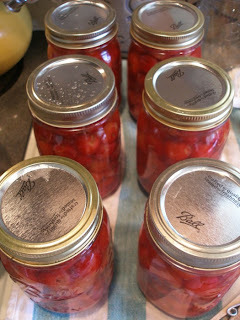 Only thing I have ever canned was blackberry jelly and jam,But I want to can more this year.go to the farmers market and get lots of veggies this year.I will look forward to your post.Thank you for this blog,it is truly awesome !! Do I need a real caner to can veggies or can I do it in a hot bath ?? like I do the jelly's ? tammy, You can only can certain veggetables in a hot bath- those that have high enough acidity (like tomatoes). Those that don't (like green beans, for example) have to be canned in a pressure canner. Check out my Preserving page at the very top of this blog. I give instructions on what you can can with a hot water bath canner only. I don't have a pressure canner (yet:-)). Oh, and a large pot with a lid tall enough to cover the height of your jars with water will work fine, but an actual canner will give likely give you a more space. It all depends on how much you plan to can and if your pot is tall enough. Hi! I'm a little late to the party, but I just made my first small batch of plum jam, and had a few questions. Do you dry the rims/undersides of the lids before you put them on the jars? can I put the lids down on the counter before I put them on the jars, or will that contaminate them? 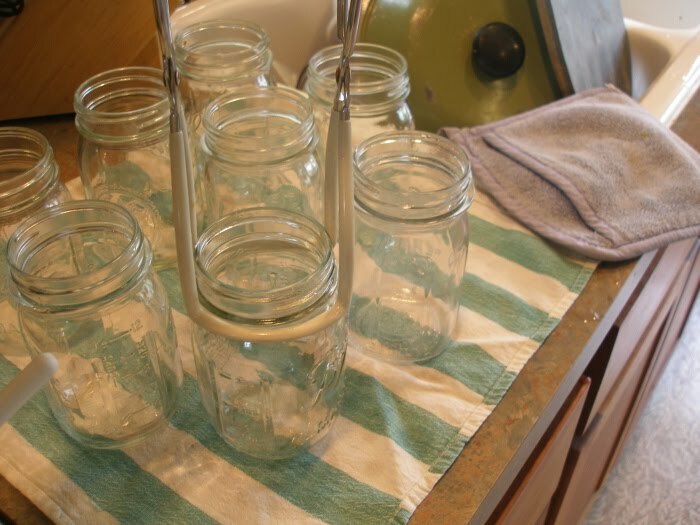 Also, if it takes a while to fill the jars (or you walk away...), and the water you boiled the jars in to sterilize them has cooled, should you heat it up again before adding your jars? If the jars and sterilized water cool down, is that still safe, or do you need to do it right before you fill the jars? I attempted my 1st this summer, as we live in the UK where canning is not the norm. I use jam jars which I wash and sterilised in the oven before filling them and again in the oven for low heat 10 minutes in a water bath after filling the jars. So far, so good. I have made gooseberry, raspberry and blackcurrant jams as well as coconut custard jam. They are sealed and airtight as I tried a few jars, they all 'pop' when after coming out of the oven and 'pop' when I open them. I also made apple sauce and pineapple jam and canned them in the same method. Hi, Pearls! I'm also in the UK and hoping to start canning this year... Did you just use the lids that came with the old jam jars? I have found the old waxed paper and plastic disks onto hot jars to be pretty unreliable in my damp kitchen. Yuck! But buying in proper jars and lids, etc seems quite an investment, especially as the lids are not reused. Any thoughts on this, Jane? Good luck with yours this year! So you only have water coming up to the shoulders of the jars? I always read it has to cover the lids by 1 inch! It would be a lot quicker your way! I always try for shoulders or above and have good success:-). Yes, this is normal and okay! Sometimes mine start popping when I've taken the canner lid off- before I even lift them out. A nice, early seal should be celebrated! Cover the jars with at least an inch of boiling water! If you don't you may not get rid of all the bacteria. Check out the Ball canning book. Hello, In my grandma's canned pickle recipe, after the 30 minutes in the oven with an inch of water in the kettle, we are suppose to tighten the ring on each jar as we take them out and place on a towel to wait till we hear that pop. In your instructions, what would be the purpose of the ring if you don't tighten after being in the kettle in the oven? Hi, Lori:-). The method of using rings outlined above isn't my own- it's the recommended method per the manufacturer of canning lids (http://www.freshpreserving.com/getting-started). There is a reason/science behind tightening the rings at that point. I know that our grandmothers had different ways of canning- mine reused lids repeatedly and they sealed fine! I'm just passing along the safest, most tested method I'm aware of to ensure proper sealing (and safe foods). Happy canning!